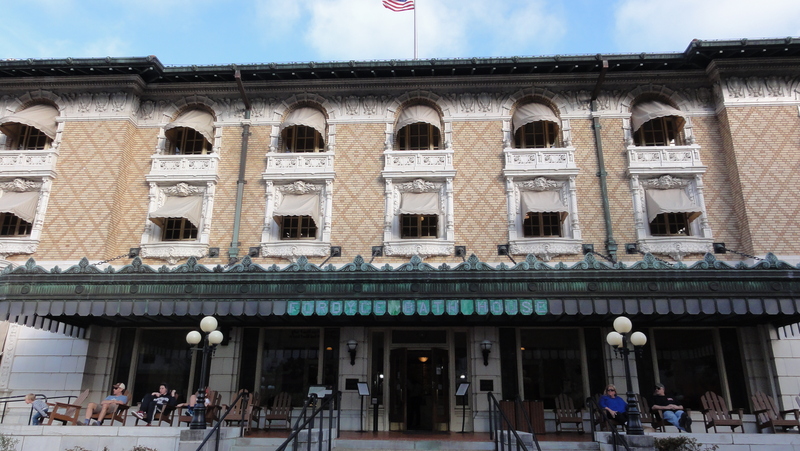 Hot Springs National Park is known for one thing – Springs of hot water. This park is an example of an era gone by, and the changed nature of recreation. Hot Springs National Park surrounds the city of Hot Springs National Park. It’s very confusing because the town is actually named Hot Springs National Park. The name of the town includes the words National Park. So, you have the Hot Springs National Park located in Hot Springs National Park. Got it? Good. The practical effect of all this naming confusion is businesses in the city of Hot Springs National Park can claim they are located in Hot Springs National Park. It all still comes down to money. This was the smallest official national park until 2018, when the Gateway Arch became an official national park, which made Hot Springs the second smallest. Hot Springs National Park has two basic attractions. Many come to see Bathhouse Row, a row of eight old bath houses dating back to the 1890s. Bathhouse Row is in an urban setting but backed up to the Ouachita Mountains from which the hot water flows. Mountains surrounding the downtown area is the other main attraction. Two of the historical bath houses are in operation – the Quapaw and the Buckstaff. Buckstaff is the longest continuously operated bathhouse in the city. It opened in 1912. 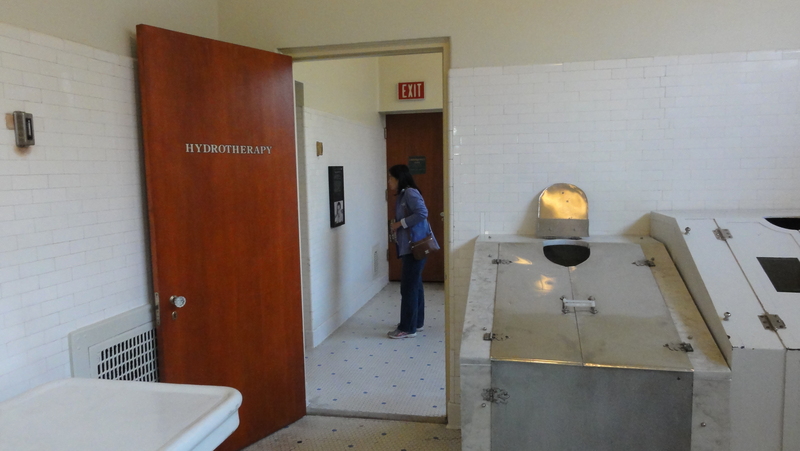 The visitor center is in the refurbished Fordyce Bathhouse, with exhibits of old showers, tubs, gym, and parlor. Men had the larger and better equipped rooms, no sexual equality back then. The bathhouses are very nice representations of architecture in the early 1900s. Water flowed into the cracks in the mountain in this part of Arkansas to reach a mile into the earth. Water was heated and bubbled back up to the surface, picked up minerals, and flowed out as springs at a consistent 143 degrees. 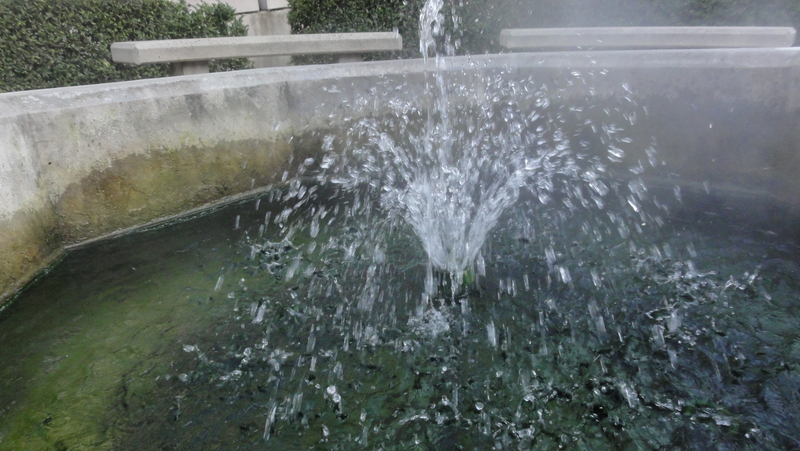 We saw several public fountains downtown with constant flow of hot spring water. Even on a warm day, the steam shrouded the fountain and created a mysterious look. The geology of the springs is relatively straight forward. There was a constant flow of hot mineral water sufficient to supply the bathhouses. The water that flowed out of these taps came down as rain 4000 years ago, taking its time to reach the hot interior of earth before coming back to the surface. Hot Springs was first protected in 1832 as Hot Springs Reservation by Andrew Jackson as the first reservation of the country. In 1921, it gained National Park status. People came from all over the country to soak in its hot mineral water. Doctors prescribed soaking and relaxing as remedies for all kinds of ailments. Back then, a hot bath required a lot of work and only the rich can afford it. Soaking in a hot bath was relaxing and took the stress away, but it certainly didn’t heal most diseases. Even so, the lack of advanced medicine at the time made the prescription of relaxation healed more than it was claimed. 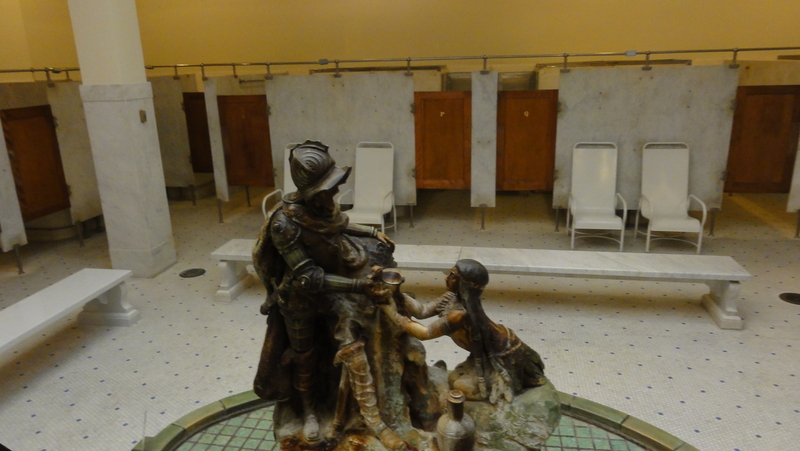 Today, no medicinal claims are made for the hot mineral water from these springs. People don’t have to come to Hot Springs anymore to enjoy a hot bath. The main attraction is no longer a novelty. Hot Springs is nicknamed “America’s Spa”. In the early 1900s, many famous and infamous people came to Hot Springs to relax and heal. Notables included Babe Ruth and Al Capone. The Cubs started spring training at Hot Springs in 1886. Illegal gambling and prostitution were very popular in the late 1800s and early 1900s, when many gangsters fought turf wars. Since we were at Hot Springs, I had to try a hot bath. I’ve never been to a bathhouse before. The whole idea of sitting in a hot bathtub with a bunch of strangers just seemed weird. Loretta wanted no part of this but I tried to convince her. “We got a free coupon for 20 minutes of bath”, appealing to her sense of frugality. She said “Why do I care about free when you can’t pay me to do it”. I said “If you don’t want to do it in public, they have private rooms”. She said “I’ve done my duty by going on a boat at Dry Tortugas. You used up your water rights for the trip already”. You see, she is not a water person. Anything that involved water gave her second thoughts. I I gave up and went solo. She, of course, went shopping. There were two basic choices for bathhouses. The Buckstaff offered the traditional experience like it was in 1922. The Quapaw offered the modern experience. Since we got a free pass as part of a bed and breakfast package at Prospect Place, and I wasn’t a bathhouse history buff, I went to the Quapaw. I was very pleasantly surprised to find a clean, well kept locker room and 4 pools. Each pool was a different temperature, from 95 degrees F to 104 degrees F. I tried the 101 degree pool. The hot water relaxed my muscles, especially after a morning of hiking. My whole body relaxed as I sat in the warm water. After 20 minutes of soaking, I went upstairs for a relaxing massage. Usually, when I get out of a pool or a whirlpool, I feel a layer of chlorine sticking to my skin and immediately want to rinse off. With the water at Hot Springs, I didn’t get this feeling coming out of the pool. I was assured the water is exactly as it came from the hot springs, temperature controlled with cooled springs water. The water seemed magical. The whole experience was excellent. West Mountain is west of Central Avenue, the main street where the bathhouses are located. To the east is the Hot Springs Mountain. 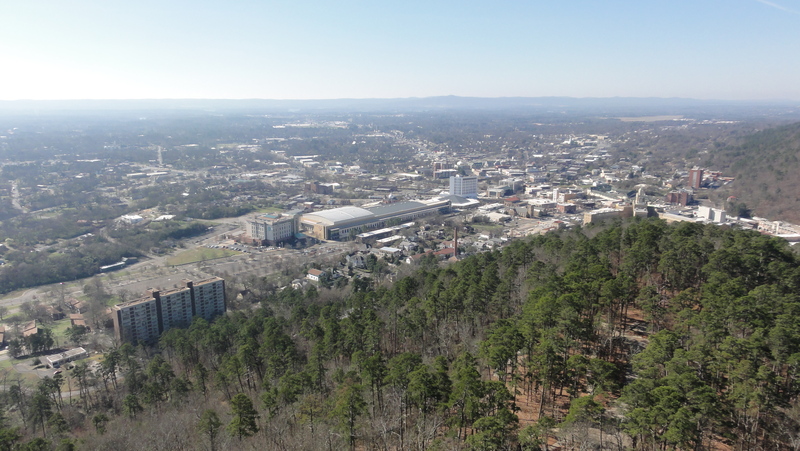 There is an privately run observation tower in Hot Springs Mountain that gave a nice history of the town and an excellent view of the city below. One big emphasis of history was that Bill Clinton went to Hot Springs High School, just down the street from downtown. We hiked the Hot Springs Mountain trail, which was pleasant. West Mountain has more trails, including the 10 mile long Sunset Trail. Frankly, these trails are just average. They go through forests and have some good views, but not especially spectacular. The mountains nearby do provide a nice contrast to the town and the hot spring bathhouses. Some trends are here to stay while others fade away like bathhouses. Change with the times before the fads fade. Hot Springs was protected at the right time, and the National Park was established for the right reason for its time. Today, it’s a nostalgic view of a bygone era. This park is the only park in the middle of a town, which is not the picture of a National Park for most people. The springs of hot water is interesting but hardly worthy of National Park designation. The mountains around Central Avenue are scenic but hardly compares to other National Parks. Even so, this is one of the more popular National Parks with more than 1.5 million visitors each year. The area is a worthwhile tourist attraction and interesting to visit. If you have not experienced a bathhouse before, it’s worth trying. Have you visited Hot Springs National Park? Leave a comment below on your experience. Take a hot bath. The hot mineral water is relaxing and must be experienced. One day is sufficient to visit. Hike in the morning. Ease the tired muscle at a bathhouse in the afternoon. In addition to the two bathhouses on Bathhouse Row, nearby hotels also offer baths with the spring water. The observation tower provided a good history of the town. A good compliment to the official visitor center. The nearby Garvan Woodland Gardens is a very nice place to visit. Consider a bed and breakfast. The one we stayed at was excellent. Size: 5,550 acres, ranked 59th. Visitation: 1,561,616 in 2017, ranked 15th. Peak Month in 2017: 215,752 visitors in August. Low Month in 2017: 78,452 visitors in January.